If you're looking for a simple yet special recipe for chicken, this easy dish is an excellent choice. 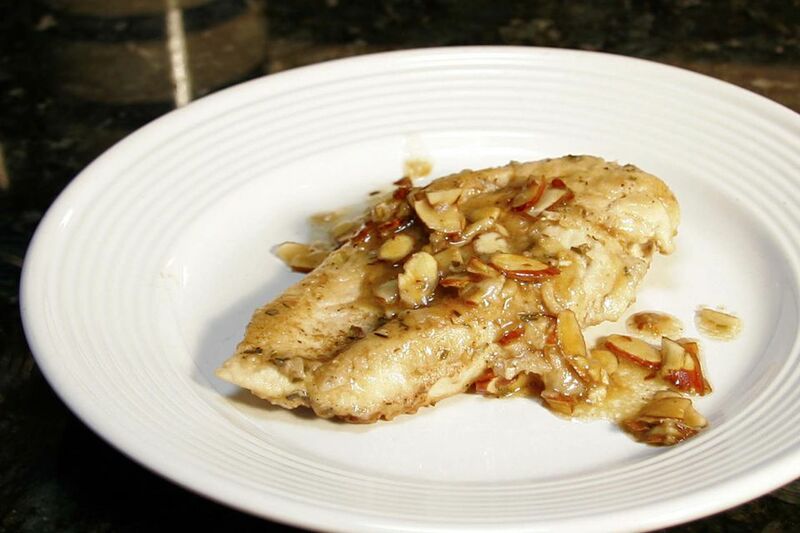 The boneless chicken breasts are cooked in a butter and wine sauce with a little rosemary and other seasonings and served with sauteed almonds. Serve this chicken with hot cooked rice and steamed broccoli or a richer Brussels sprouts gratin for a delicious everyday family meal. Heat the butter over medium heat in a large skillet. When the butter is hot, add the almonds. Cook, stirring until almonds are lightly browned and aromatic. Remove almonds to a plate or bowl with a slotted spoon or spatula, reserving butter in skillet. Set the almonds aside. Combine the flour, rosemary, salt, and pepper in a bowl. Dredge the chicken breast halves in the flour mixture. Brown chicken over medium heat in the reserved butter for about 4 to 5 minutes on each side. Add the green onions and garlic to the skillet and cook for 1 minute longer. Cover the pan and reduce heat to low and simmer 15 minutes, or until chicken is done. With a slotted spoon or spatula, remove the chicken to a serving platter; keep warm. Bring juices to a boil; stir in reserved almonds. Taste and adjust seasonings. Spoon almond mixture over chicken. Serve with hot cooked rice, if desired, and enjoy!